History: To add everyday experiences for guests who visit Disneyland, Olszewski created a series of accessories. These include the Yellow Truck or also known as the Horseless Carriage shown above. 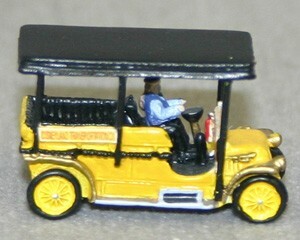 These are part of Olszewski's miniature Main Street Vehicle Collection that one will find at Main Street, U.S.A.